Wizkid made history by being the first Nigerian artist to sell out the legendary 02 venue in London that has a capacity of 20,000. Wizkid’s Afro Republik show was a feat for the Nigerian music industry and Starboy made history in a N992K Palm Angels tracksuit. Wizkid is known for his stylish on-stage outfits and he rarely disappoints on the fashion front. From his N1.4m Gucci jumper at his show in Nigeria in December to his head-to-toe Gucci look at Davido’s 30 Billion Gang outfit. It’s no wonder that Vogue magazine has voted Wizkid one of the best dressed artists in the world. 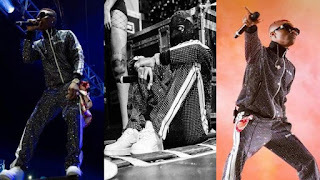 For his show in London, Wizkid chose a dazzling tracksuit from American brand Palm Angels. The tracksuit, which retails for the equivalent on N992,000 was covered in shiny dots which reflected beautifully off the lights on the stage and made Wizkid look every inch the star he has become. It was easily one of the best outfits of the night.